Jumbo Banner 8 ft. x 8 ft.
Silver Large 8 ft. x 8 ft.
Large Tube 6 ft. x 6 ft.
Large Tube 7 ft. x 7 ft.
Large Tube 5 ft. x 5 ft.
(JN-4) 4 ft. x 8 ft.
(JN-4) 4 ft. x 4 ft.
Aspen Onyx 3 ft. x 8 ft.
Aspen Onyx 5 ft. x 8 ft.
Aspen Onyx 4 ft. x 8 ft.
Aspen Onyx 5 ft. x 7 ft.
Aspen Onyx 3 ft. x 7 ft.
Aspen Onyx 5 ft. x 6 ft.
Aspen Onyx 4 ft. x 7 ft.
Aspen Onyx 4 ft. x 6 ft.
Aspen Onyx 2 ft. x 6 ft.
Aspen Onyx 2 ft. x 7 ft.
Aspen Onyx 2 ft. x 8 ft.
Aspen Onyx 3 ft. x 6 ft.
Get your message out with catchy and creative exhibition booth design for your next trade show or display show in Virginia, Maryland, Washington D.C, Vegas or anywhere in the US with our big banner stands. Whether a trade exhibit or a trade show presentation, our trade fair stands can give you the material you need to get your message seen the best with a clear and crisp image. No matter which display systems you choose, we can accommodate any business! Start by choosing your stand banner design and we can help you create a design that works best for your vision. Our custom show displays use large banner stands that are lightweight and made of strong material making it durable and sturdy. Our pop up display banners at Capital Exhibits are equipped with grommets to securely attach your graphic to the stand of your choosing. These are ideal for any trade show exhibit, booth design, or exhibition trade show. These banner display holders help display your trade fair booth design evenly. Ultimately these exhibit graphics and booth designs are the perfect way to promote your advertisements or for use during promotional events such as a booth presentation or booth exhibition design. Our big banner stands are designed for trade exhibits, rental trade show exhibits, conference events and trade fair booths. When it comes to trade show marketing, finding accessories for your trade show can seem daunting. Thanks to the help of our expert team, we offer big banner stands in a variety of sizes to meet the needs of every business with our booth display design service. Create custom show displays for your next pop-up display or exhibit designs with our shoe banners. When you’re exhibiting at a trade show, you want to use the most professional materials that convey your company’s message with ease. These displays can help you get the attention of the audience you’re looking for. This can help increase your bottom line and increase business with eye-catching imagery. We can help you to choose the proper big banner stand and also create something to display on it for a variety of businesses. Leave it to our professional graphic design team to make your message come to fruition. Whatever your banner stand needs are, we at Capital Exhibits have you covered. 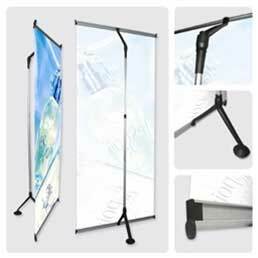 We offer indoor and outdoor banner stands as well as green banner and X-stands. Our stands work great for trade show display exhibits, booth shows and exhibit rentals. 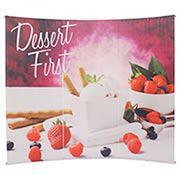 You can design custom banners to be display with the use of your big banner stands. To learn more about our big banner stands and our banner design service for your exhibit display design and fair displays at display shows, contact our professional graphic design team at Capital Exhibits today.